This type of situation is a scary one for me. Why do you ask. Well my home has a split floor plan. Half my family is on one side of the home and my wife and I are on the other side. So clearing the house would be difficult and dangerous due to the fact if I have to engage a threat (bad guy) rounds could be off target and they could hit one of my 3 kids on the other side of the house. So I have a two choices; 1) Grab my shotgun and use that or 2) Grab my Glock 35 (with a 20 round magazine) and use that. Now the shotgun would be my first choice but using a long gun traversing hall ways could be bad. Why do you ask. If a trained suspect was waiting he could grab the barrel of the shotgun while I turned the corner and than a struggle would happen. So than my second choice is a handgun and it could be a better choice because I can keep the weapon at the ‘high ready’ (weapon pointed straight ahead but arms all the way towards (pressed) my chest. This is a great tactic for close quarters as it keeps the weapon close to you and when moving around tight 90 degree corners (yea yea, cut the pie like a SWAT officer) it keeps the weapon system (handgun) close to you so if a bad guy is hiding around the corner he would not be able to knock the weapon out of my hand or take it away from me. Excuse any typos due to me using a smart phone to type this. I am very happy to find out you guys had an App. Love the show keep up the great work. 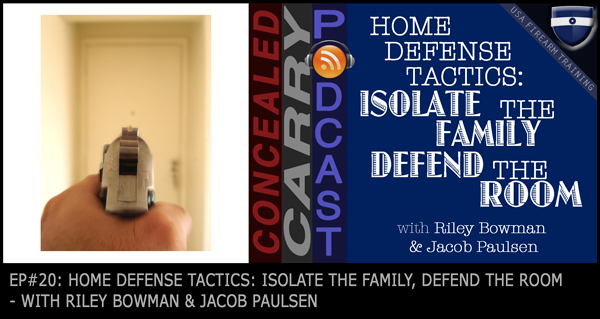 Another great training topic on the pod cast! So glad you guys are able to present these topics to the public so they can better be prepared.